If you’ve ever tried my recipe for How to Make Tofu Taste Good (or the new quicker method), you’ve likely fallen in love with tofu. Prior to discovering this method – which crisps the tofu up in the oven without any oil or cornstarch – I wasn’t a big fan of tofu. But it’s since become my tried-and-true method for pretty much all things tofu! The baking method works beautifully in this simple, 9-ingredient vegetable stir-fry infused with almond butter for added protein and nuttiness. Shall we? This is my new favorite stir-fry recipe because it is so easy to make, is ready in less than 1 hour, and packs plenty of plant-based protein and fiber. 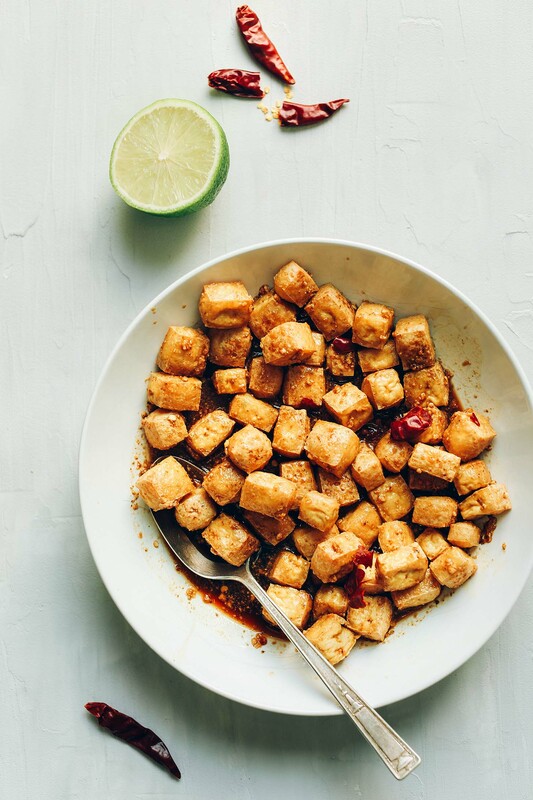 Baked tofu is marinated in sesame oil, tamari, lime juice, chili garlic sauce, maple syrup, and almond butter, which acts as an extremely flavorful sauce for the rest of the stir-fry. Once the tofu is marinated, all that’s left to do is stir-fry the tofu and veggies! I went with green beans and cherry bomb peppers, but you could use whatever vegetables you have on hand. I think zucchini, asparagus, or even sweet potato would be delicious! This would make the perfect weeknight meal when you’re craving something hearty yet healthy. It’s extremely customizable: Sub peanut butter for almond butter, cauliflower rice for brown rice, or whatever seasonal vegetables you have on hand. And it stores well, making it perfect for leftovers the next day! 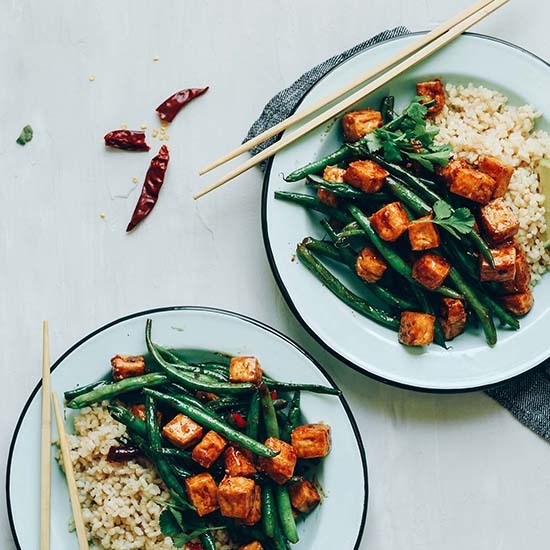 For more stir-fries, check out our General Tso’s Tofu Stir-Fry, Vegan Singapore Noodles, Crispy Peanut Tofu + Cauliflower Rice Stir-Fry, How to Make Tofu Taste Good: Stir-Fry, 30-Minute Portobello Stir-Fry, and Thai Noodle Bowls with Almond Butter Tofu. If you try this recipe let us know! Leave a comment, rate it, and don’t forget to tag a photo #minimalistbaker on Instagram so we can see what you came up with. Cheers, friends! 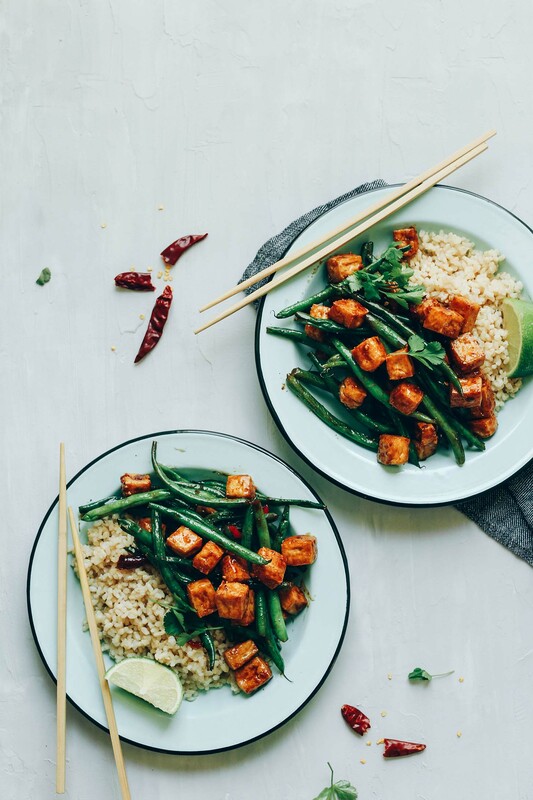 Easy, 9-ingredient tofu stir-fry with baked tofu marinated in an almond-tamari sauce. Serve with veggies and rice for a flavorful, plant-based meal! Preheat oven to 400 degrees F (204 C) and line a baking sheet with parchment paper. Also wrap tofu in a clean, absorbent towel and set something heavy on top - like a cast-iron skillet - to press out excess moisture. 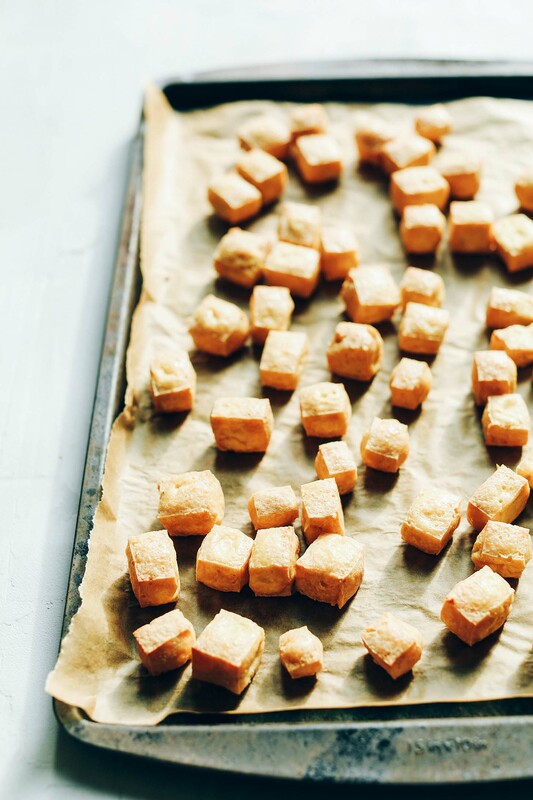 Once oven is preheated, unwrap tofu and cut into small cubes. Arrange on the lined baking sheet in an even layer and bake for 25-30 minutes or until puffy, dried out, and slightly crispy on the edges (see photo). This step helps crisp up the tofu. The longer you bake it, the firmer and crispier it will get, so adjust cooking time accordingly. In the meantime, to a small mixing bowl, add half of the sesame oil (1 Tbsp as original recipe is written // adjust if altering batch size), tamari, maple syrup, almond butter, lime juice, and chili garlic sauce/red pepper flake/Thai chilies. Whisk to combine. Then taste and adjust flavor as needed, adding more almond butter for creaminess / nuttiness, tamari for saltiness, lime juice for acidity, or chili garlic sauce for heat. Set aside. If serving with rice, prepare at this time (see notes). Add baked tofu to the almond butter-tamari sauce and let marinate for 5 minutes, stirring occasionally. The longer it marinates, the more intense the flavor, but I find 5-10 minutes to be sufficient. Heat a large skillet over medium heat. Once hot, add the tofu, leaving most of the marinade behind (this will be added to the vegetables for flavor). Cook for about 5 minutes, stirring occasionally, until browned on all sides and slightly caramelized. Remove from pan and set aside. To the skillet, add remaining sesame oil (1 Tbsp as original recipe is written // adjust if altering batch size), green beans and peppers and 2-3 Tbsp (30-45 ml // amount as original recipe is written // adjust if altering batch size) of the marinade. Cover to steam for about 4-5 minutes or until green beans are slightly tender. Then remove lid, increase heat to medium high, and add remaining marinade and the tofu. Cook for an additional 1-2 minutes, stirring frequently. Then remove from heat. Serve as is or over cooked rice or cauliflower rice. For more heat, serve with chili garlic sauce or Sriracha. Best when fresh. Store leftovers in the refrigerator up to 3 days. Reheat on the stovetop or in the microwave until hot. *To cook brown rice, I use the Saveur perfect brown rice method. To cook white rice, add 1 cup white rice and 1 3/4 cups water to a small saucepan and bring to a boil. Then reduce heat to a simmer, cover, and cook until tender - about 20 minutes. *Tofu method adapted from How to Make Tofu Taste Good. *Nutrition information is a rough estimate calculated without rice. This recipe went together really well. I don’t have an oven, so I prepared the tofu as Iusually do, in the pan. I only used 3/4 of a pound of green beans, because that’s what I had left from another meal. It seemed about right to me. The thing that’s really made the meal was the marinade. I had stopped using almond butter because the price has gone way up, but splurged. Well worth it. This is one of our favorite recipes. We try to eat meatless 4-5 times per week. I always add extra hot! Great with broccoli too. Thanks for your excellent recipe ideas. As retirees, we try and eat as healthy as possible so we can be here for our grands for many years to come. I’ve made this recipe more than a dozen times. It’s definitely one of my favorites from your blog! It’s delicious, simple, and yields wonderful leftovers! Hi, I haven’t done much cooking with tofu and am wondering if firm tofu would work just as well as extra firm? Just bought a four-pack at Costco… Thanks! Yes, that should work though you may find it falls apart more than extra firm tofu! Love this recipe! Made it with peanut butter instead of almond butter. Next time I’ll double the recipe and maybe add extra vegetables so we have leftovers. This is absolutely delicious and will become a regular go-to. I am so glad you have shared how to make the tofu good without frying. This sauce is so yummy. I will likely not use the 2nd TB of sesame oil next time – it’s just not my favorite flavor. And I will likely try this with broccoli next time. Thank you!!! Thanks for all your great & healthy recipes. I hadn’t been eating much tofu (8 years vegan) because I didn’t know how to prepare it well. I’ve been experimenting lately (Costco sells a case of firm tofu in the refrigerated section! Who knew?) and this recipe was one of the first I tried. I saw online that a Japanese method to make tofu absorb marinade and stir fry better is to freeze and thaw it before using, and it’s definitely something you should try! It adds another step to any recipe, but I throw the baking sheet with the thawed cubes of tofu right into the oven. Super spongy on the inside and crisp on the outside. I’ve made this before and it’s easily my go-to when I have guests! Quick q…can the tofu be made a day ahead to speed up cook time? This was great and so easy. I used a serrano chile and red bell peppers but will try the Thai chiles next time as it was not spicy enough for me even after additional garlic chile paste. The tofu was rather tough and was wondering have you tried this without baking the tofu? I used Trader Joe’s Organic extra firm tofu. Served over cauliflower rice. Will make this again. Thank you! The was great and so easy. I used a serrano chile and red bell peppers but will try the Thai chiles next time as it was not spicy enough for me even after additional garlic chile paste. The tofu was rather tough and was wondering have you tried this without baking the tofu? I used Trader Joe’s Organic extra firm tofu. Served over cauliflower rice. Will make this again. Thank you! Sooo goood!! I made mine with Japanese sweet potato, carrots, bell pepper, and broccoli. Thank you for your delicious vegan recipes!! This recipe was delicious! Great for a meat-free super healthy dinner and leftovers for lunch. I sliced my tofu in half to create 2 big thin rectangles before wrapping in towels to get the water out, which seemed to speed the process up and made for perfectly crispy tofu. I tossed it with 1 Tbsp olive oil, 1 Tbsp tamari, and 1 Tbsp cornstarch, then threw it on a well-seasoned cast-iron pizza pan. After stirring occasionally it was perfect in about 30 mins. I didn’t want to take the extra step to marinate the tofu and then re-heat it in a pan, so while the tofu was cooking I sautéed my veggies (asparagus, carrots, shallots, cabbage, yellow pepper, and kale) and just combined everything at the end. I also added grated ginger and garlic to the marinade. I definitely increased this to more than 10 ingredients, but it still turned out fantastic and took minimal effort. Whole family loved this dish! Yay! Glad to hear it, Eileen! Great recipe! The tips for making the tofu crispy were spot on. My first try and my family loved it! Yay! Glad to hear it, Lillie! This was so quick and easy tho I’m so happy I made this and I’m gonna make it forever now!!!! super easy and super yummy to make ! 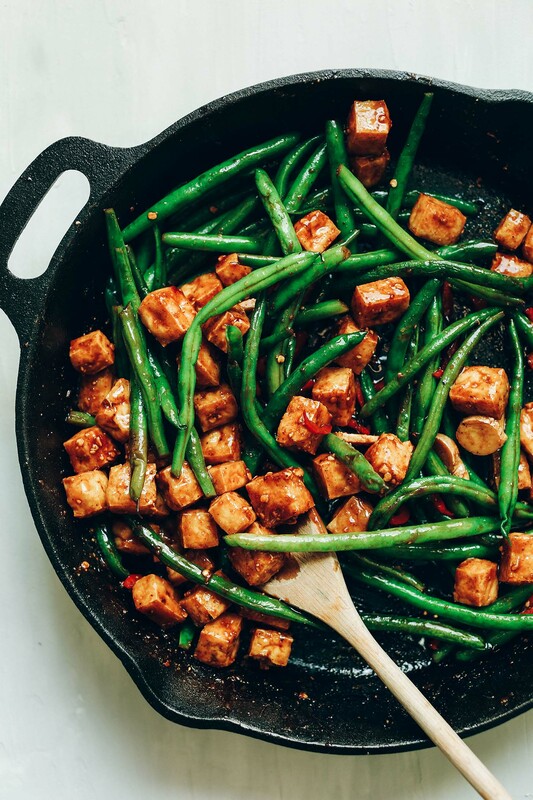 i usually make this when i dont have any ideas on what to cook that night or if i’m low on ingredients but I always have tofu and some veggies stocked so that makes this super convenient. Just perfect! Easy. Tastes like there’s no way you made this yourself. Perfect balance between salty and sweet. The almond butter gives it a creamy texture and delicious nutty flavor. I didn’t have peppers so just used extra pepper flakes. The 1/2 lime I had was desiccated so I used the zest instead. Made an adapted version of this for dinner tonight and it was delicious. The adaptations involved the use of silken tofu as it was all I had. Instead of just baking the tofu cubes, I used the convection mode to make sure the tofu dried well, It was perfect and caramelized very well. Also had no green beans so used green peas instead. The spicy sauce on the sweet peas was amazingly delicious. Otherwise, I followed the recipe exactly and we really loved it. Thanks. Loved this! Turned out amazing and my husband wants to include it in our rotation. So delicious! I don’t usually care for tofu unless it’s firm and crispy, and this was perfect! This has become a staple dinner for my wife and I. Thank you so much! Incredibly delicious and straightforward. Would recommend to anyone! Fabulous. I made it with broccoli and red bell peppers. Next time (and there will definitely be a next time) I’ll be more creative with the veggies. The marinade is fabulous. I made this a few times last year and was thinking about the marinade when I saw some nice broccoli in the store so made it again tonight with broccoli instead. I love the flavor of the marinade and the tofu-crisping method but found that unless green beans are in season they are tough and stringy. Tonight I roasted the broccoli with the tofu and finished the dish on the stove after marinating the tofu in the sauce. Now I’m thinking which other veggies could be good here! :) Thanks for another great recipe! I made this with peanut butter instead, because it’s what I had on hand. It was amazing! It’s now a staple! ??? Wow. I have never made tofu at home before although I often order it when eating out. I found your blog and thought this looked delicious and approachable. The marinade is fabulous. My husband told me twice it was very good. I subbed peanut butter for the almond butter since that’s what I had on hand. I am excited to try so many of your other recipes. Thank you.? SO GOOD!! I love how simple and tasty the marinade is, and and how versatile the recipe (lots of good green veggies work!). I used shallots instead of hot peppers one time, and broccoli and broccoli stems. One question: Is the marinade okay to make in larger quantities to store for another meal later on? How long would it last in the fridge? Freezer (or would it even work there)? Thank you so much – I love your blog and use your recipes all the time! Hi Lucy! You can make it in larger quantities to store for later! My boyfriend has always been very open to my vegan lifestyle, and has always been open to trying out your incredible recipes. When I told him we were having tofu for dinner, he definitely wasn’t the happiest of bunnies…but boy was he surprised by the end result! He LOVED it. He’s already cooked it up for himself multiple times! Keep up your amazing work Dana! I made this! And made the boyfriend eat some veggies and tofu! He liked the sauce, it reminded him of a satay sauce. Ate the almond butter tofu stir fry (sweet potato, baby brocolli, carrot, zucchini, with agave) on cauliflower rice with spike and earth balance butter…. yum. I will try this recipe again, maybe follow measurements in recipe a tad better next time. Thanks for the recipe. This was so good! Thank you! That tofu is something else. This was my first attempt at cooking tofu and I couldn’t be happier about it! I am definitely going to repeat this recipe (or some variation to include this marvelous marinade!). Hi, I loved the idea of this. I had to sub honey for the maple syrup because I live in Mexico and can’t find maple syrup here. I also added some chopped garlic to the marinade. I toasted the tofu and put it in the marinade. When I pulled out the little tofu cubes and went to fry them, the little bit of marinade still on them began to burn almost at once. I had to take them out of the pan, and get a new pan for the vegetables, because I have a black charred mess at the bottom of the other pan. I used a mix of green beans, bell pepper, broccoli,celery, and green onion.. Because I was worried about the burning, I added about a half cup of water with the 3 T of marinade when I cooked the vegetables. When they were ready, I put the tofu back in with the rest of the marinade, and some glass noodles I had softened. I had to cook out some of the water, but the end result was delicious! I’m wondering if it was the honey that made it burn, but I think any sugar would do the same. I’m wondering if I should skip the tofu frying first step. What are your thoughts? This was so delicious and satisfying and easy. I used peanut butter instead of almond butter. Will be making this often! Making this for the third time sooo good Justin added a bit more water to thin down the sauce and tried it with rice noodles too. So good! This came out delicious. I found the directions a bit confusing and marinaded the tofu in the wrong sauce combination but ended up just adding that sauce to the tofu at the end, mix ups aside i doubled this recipie and it was awesome! Made this a couple of nights ago and it is officially my new favorite recipe! I used green beans, eggplant, and green bell pepper for my vegetables, and just put in some chili flakes and crushed garlic as I didn’t have the sauce. I also tried your way of baking the tofu (revelation! ), and the Saveur brown rice method (and here I was thinking the brown rice I buy just couldn’t get that fluffy – so excited that I never have to eat mediocre brown rice at home again). Thank you for this fab recipe; it is sure to go into heavy rotation! I have a good size family and they like a lot of sauce so I tripled this recipe. To account for the dish having so much sauce I added some water to the marinade to reduce the saltiness and added in some extra flavor with some powdered ginger and garlic powder. I also reduced the maple syrup to just about 2 TBSP per batch of sauce and it had a nice sweetness. Lastly, I sprinkled in some corn starch to help the sauce thicken up in the pan a bit. This was my first time making tofu and this recipe was great! I didn’t have almond butter, so used pb. I also didn’t have any lime, so just left it out. The sauce was amazing. I don’t like spicy things, so didn’t add any peppers, but added about half a clove of garlic to the sauce. The flavors of the sauce were great, a bit strong at first taste, but then the flavors all came out and it was really good and I am a very selective eater! I had some leftovers I will be finishing up and will definitely be making this again! I’ve only made baked good successfully, never really cooked entrees or savory meals well. I’ve been making a lot of salads from minimalist baker and it has gone great! I finally dove in and tried making hot food- this dish is amazing. It was easy to make and tastes delicious! It actually looked like the picture when it was done. Can’t wait to make it for friends. I am going to make a claim and state that this is probably thee best tofu recipe in the history of life! I have made this recipe twice, and it has even converted some non-tofu-lovers. My only remix to it was that I used red bell peppers instead of the spicy peppers for the veg., and skipped out on the lime juice, but hands down my favourite! This was delicious. I doubled the marinade as was suggested by someone else and used half the chili pepper with 1 clove of grated garlic. My whole family including toddler loved it with cauliflower rice. I just made this for dinner and it is EVERYTHING!!!!!!!!!!!!!!! Thank you!! So much nostalgia about sesame chicken & its sauce, now I will never have to be sad about craving chewy saucy Asian goodness hahaha…. Delicious! The only deviation I made from the recipe was subbing peanut butter for almond butter. I served this over the Cauliflower Rice recipe from this site and it made for a wonderfully satisfying meal. I want to pour the sauce over everything now, it’s so good! I’ve made this recipe three times in the past week. The sauce is MIND BLOWING. Adding the nut butter makes it next level delicious. I’ve been throwing together whatever veggies I have around the house (napa cabbage, green beans, edamame, snap peas, zucchini). Does it have to be strictly sesame oil, or can I subsitute with toasted sesame oil? Hi Lee! Toasted sesame oil is used for a seasoning, where as regular sesame oil is used for higher temp cooking or frying/stir frying. Regular sesame oil is the best for this recipe! Followed the recipe completely. The tofu tasted like it had been assaulted. It was too chewy and the edges were hard. The sauce is good, though. This was so flavorful! 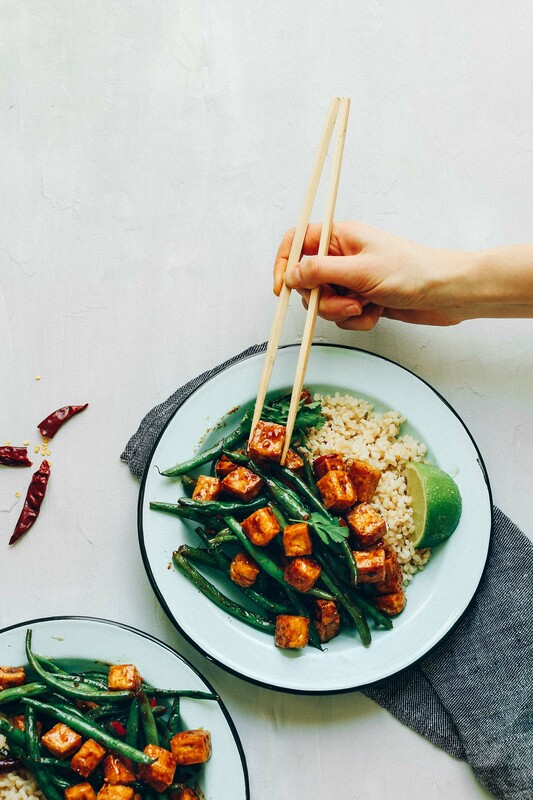 Tofu for me has always been difficult to marinade and have the flavor actually come through – not the case with this recipe! I will definitely be making this again, the family loved it. Made this for dinner, it was one of the best tofu dishes that I have ever made! This recipe was delicious! It definitely made stir fry more interesting for me (my husband asks for stir fry at least once a week). Baking the tofu before marinating it is such a good idea. I did make one small change by cutting the maple syrup to 1.5 tablespoons and it was perfect to me. Will be sharing this with my vegetable-averse sister. Your recipes are always so good! This is another winner! Made it tonight, I love the baking method for the tofu! I just made this for the second time this week and it is quickly becoming one of our favorite dinners! The flavors and the textures make it so delicious! Also, I followed the How to Make Tofu Taste Good, and it is seriously the best! I followed the recipe exactly and this makes 3 servings, and is just as good the next day. Thanks for another awesome recipe, Dana! This was my first recipe cooking with tofu (and my first time eating it)! I have an EXTREMELY picky husband, and we BOTH loved this dish! I made it exactly as directed, with the exception of not using fresh lime juice–I just used the juice out of the little plastic limes you can buy at the grocery store. We also used soy sauce instead of tamari as we are not gluten free. Thank you for making your recipes detailed enough for beginners–I can’t wait to try another one of your recipes! Hi! Long time lurker, first time poster. This was absolutely delicious! My first time making tofu at home and it turned out great. Thank you! I added green onions to bulk up the veggies a bit and it was all fantastic. This was incredibly tasty!! I subsituted one part molasses and 2 parts honey for the 3 tbsp on maple syrup, used peanut butter instead of almond and soy sauce instead of tamari. Loved the tofu technique!! Will make this again! I’ve made this twice in one week. YUM! Thank you for this recipe! Only my second time making tofu – loved this recipe! Super easy, and the flavor was outstanding! Loooove this dish. It will definitely be apart of my rotation for meals for the family. Just made this scrumptious stir fry, so flavoursome!! Perfectly nutty, spicey and with a zing of lime. Will definitely be making this again! This was absolutely delicious- easy and very adaptable to what I had on hand. Cannot wait to have leftovers for dinner tomorrow! Holy smokes. This might possibly be the best tofu recipe I have ever made and consumed. Thank you, Dana!! I made a few adjustments (1 tbsp less tamari because I don’t like very salty things) and used broccolini instead of green beans because that’s all I had, but surprisingly (or not) the broccolini was the perfect vehicle to devour that delicious sauce. I garnished our plates with chopped green onion and sesame seeds, but honestly I could just eat this straight out of the pan. I’m sharing this with friends, family, strangers, anyone who will listen and I’ll make it again and again. Thank you – it was perfection! This was really delicious! It’s subtle but addicting. I will definitely be making again, next time with peanut butter! I’m not sure if I did something wrong, but my tofu didn’t turn out that well. The flavor was fine, but the tofu just turned out rubbery using this method. Do you have any idea why that might be? Delicious! Added some bok choy at the end. I try not to repeat too many recipes very often, but this is a winner in my household and has been on an almost weekly loop! As an occasional pescatarian, I’ll sub tofu for shrimp tonight to reduce some prep time (though I prefer the cripsy tofu). When I don’t have the peppers on hand, I use garlic, rice vinegar and chili/garlic sauce. Cauliflower rice FTW! I am currently making this right now…. (steaming the veggies) but i just had to sneak a piece of the marinated tofu…and OH MY GAAWWWWWWWWWWWWDD (i am from long island so the pronunciation is correct). If the rest of the recipe tastes just as good as that one small bit of marinated tofu i am going to be IN HEAVEN. Even though summer is coming (I live in Florida now, the land of perpetual summer) I had really been craving something savory (I went full on vegan in January). And this is going to HIT the spot. I am making it with cauliflower rice (just cause)……your website is amazing!!! Thank you for all the work you do so that we don’t have to!!! Excellent recipe, will try with peanut butter next time to switch it up. Thanks Dana! Perfect weekday meal for the family. My 4 year old LOVES it and I’ve made it weekly since finding it! Just made this and it is DELICIOUS! I cut the maple syrup down to two tbs because I don’t like things too sweet. And I accidentally added about 2.5 tab of lime juice. Oh and totally spaced on buying almond butter at the grocery store so used PB instead. I can only imagine how good this would be with almond butter. I also skipped the peppers and just went all in on the green beans. Stupendous! This is my first Minimalist Baker recipe. I will def be trying more! THanks! Made this the other night, but instead of rice used mung bean vermicelli because I had some on hand and it was stellar! My family is now obsessed with this dish. Tofu is not on my normal foods that I prepare; however, this looks delicious! However, rice and veggies are on my list, so I will try this out soon! Thanks! Made this tonight, doubling the sauce and using a whole red pepper instead of hot peppers. The entire family loved it! Made just the tofu last week to use in banh mi sandwiches, and that was amazing. Great recipe overall, and great process for cooking the tofu. Great idea using the marinade for bahn mi! Made this again today. This time I marinated the tofu in the sauce a few minutes before baking and it really added a new dimension to it! It seemed to make the sauce stick to the tofu better in the pan on the stovetop once I got to that point… love this recipe! This is so amazing and flavorful. Definitely will be making this again. I made this for dinner last night and it was AMAZING! I’ve tried almost all your delicious tofu recipes, and this may be my most favorite so far! I just loved it so much and can’t wait to make it again. Perfect blend of spiciness and savory/sweet combo is spot-on! Thank you, Dana! Made this once with asparagus mixed with green beans, and it was wonderful. My only “critique,” which probably reflects more on me than the recipe, is that I struggled with the tofu getting evenly cooked and crisped, and found it difficult to turn the tofu cubes easily. Are there any solutions for that? Could I cook the tofu in longer strips instead of cubes to make flipping them easier? That would be half the recipe. I myself I am also trying to watch my sodium intake because there’s an astronomical amount in vegan recipes I find. I’m making this tonight and cutting the Soy Sauce/Chili Garlic Sauce in half to try and reduce the salt. Turned out so yummy! :D I can always trust recipes off your website! A little too many green beans for my taste, I think half broccoli would be great. I added water chestnuts and baby corn. I’d post a pic if I could figure it out. This was really, really delicious. I ended up using three TB of almond butter b/c I thought my kid would like the flavor a bit better. He ate it up. The tofu method – so simple! No oil! I can’t believe I’ve been killing myself trying to pan fry for all these years. Same here I’ve been trying for years to make delicious hearty tofu. Mystery of the world solved! This was totally delicious! This was the first time I made tofu and really felt like I nailed it… thank you! I made this with peanut butter and rice noodles, and I threw some peanuts on top for added crunch. This was so easy and delicious – I will definitely make again! This meal was absolutely PHENOMENAL!!! I’ve made it twice already, only substituting peanut butter for almond butter. That sauce is magical, so flavorful, spicy, and savory. The peanut butter gave it a wonderful consistency. I also loved baking the tofu…my first time, but definitely not my last! Two thumbs way up! A must try! I made the tofu, and that was super yummy! Rocked. i could drink that sauce. This was easy to follow, and delicious. The marinade didn’t taste ‘right’ when I made it, but when cooked it turned to a rich, tasty sauce! Great way of crisping up tofu without oil too. With this, I get to enjoy tofu and reap its benefits. Tastes like from a satisfying restaurant. Will be eating a lot more tofu in my life now. LOVED this. I made it last night, ate it again for lunch today, and have sent the recipe to several people cause I want everyone to enjoy it too. Thanks! This recipe is fantastic! Easy and quick to make, utterly delicious. My tofu acted like a Brawny paper towel, so next time I make it I’ll double or even triple the sauce recipe. And that will be soon. :) Thanks Dana—keep these yummy vegan/gluten-free recipes coming. Delicious! Made this for dinner last night with a few changes. I made the sauce exactly as your recipe stated, which is a testament to how good it is since I almost never follow a recipe to the letter, love the sauce! In place of green beans, I decided to use the remaining marinade after removing the tofu as a dressing for a cabbage, kale, carrot and daikon salad – mixed in some slivered scallion greens plus slivered almonds and sesame seeds. Served the tofu and salad atop brown rice and we devoured it. This is a keeper. Just a little note on tofu, I always use super firm sprouted tofu and find it makes for the best texture when baked or pan fried. Also, I did bake the tofu per your instructions, which I loved, but I usually cook my tofu in a non stick pan with a little coconut oil and sea salt which turns out very similar to your baking method – golden brown and crispy on the outside but still a little soft and nicely chewy on the inside. I plan to post on my blog with my changes (of course crediting you! ), but not until I make it again, since we ate it all up before I had a chance to take any pictures, best part of blogging – eating all the yummy food! Thanks always for your amazing inspiration. Delish! I made the tofu as is, and then chose to stir fry broccoli, mushrooms, and Chinese eggplant in the marinade. Will make again :) The marinade is just right on the spice level and super flavourful. I set the tofu in the marinade for about 5 minutes, next time I’ll leave it for 10. I am in love with this recipe. It took a bit longer than I thought it would, but the pay off was so worth it! I’ve never made tofu that turned out so delicious! Love this method of preparing it! I did add peas to the sauteed vegetables and roasted some cauliflower to put on top of it because this isn’t quite enough veggies for me on its own and it turned out great! This was fabulous, I loved the texture of the tofu, the marinate was yummy. I followed it up the T. As for my veggies, I used broccoli, then at the end of cooking I added a handful of raw unsalted cashews then drizzled sriracha hot chili sauce on top. Literally drooling over this recipe that I MUST try! Thank you so much for sharing. I made this last night and it was SO GOOD. It has the best sweet/sticky/sour/salty quality to it that I love about food from Asian restaurants but have never been able to recreate myself. The texture of the tofu when cooked this way is divine. Next time I need my fix of this kind of thing I’m hopping straight back to this recipe! Thank you!! unfortunately, my wife can’t hv nuts, are there any substitution? thanks ?? and be well. I used unsweetened sunflower seed butter and it turned out amazing! Hi Carlos! How about unsweetened sunflower seed butter? Thanks for the Saveur brown rice method! Thoroughly happy with this recipe—I had never made tofu or brown rice this well before. Made this tonight and we absolutely loved it! The sauce was spot on and we liked baking the tofu instead of covering it with corn starch and pan frying. Only adjustment was to add red bell pepper to make it last multiple nights. Yum! Thanks Dana, you da best!!! Sorry forgot to rate it. Five stars all around! I have had a lot of success with your recipes, so thank you! I just made this recipe for dinner and it was so delicious! I used peanut butter, and just because I don’t like spicy things, instead of the peppers, I just used about 1.5tsp of chopped garlic. This was so good! Thank you. SO delicious and full of flavor! I made this three nights in a row so far this week! Crunchy, fresh, salty , sweet, tangy…a little heat….every bite pops with bright flavor! Thank you for your magic! Keep them coming! This was AMAZING!!!!!!!! I added broccoli and onions to the stir fry! Best tofu I’ve made so far! Sounds amazing! I can’t actually have tofu but wanted to use this with my chicken stir fry. I was wondering if you could sub coconut aminos for the tamari and maybe blended up dates for the maple syrup? I am on the whole30 ; ( so wanted to make a version of this. Thank you so much! Love all your recipes! Yumm yumm. I used Peanut Butter instead of Almond; very tasty indeed! Unfortunately the Tofu turned out dry and gummy/chewie and not crispy at all. What went wrong? Maybe I try to bake them for a shorter time period next time. Interesting! That may have to do with the brand / freshness of tofu. I like buying extra firm, super fresh, non gmo and organic. Hope that helps! Heck Yes!! This looks and sounds amazing. We eat so much tofu in our house, my kids prefer it over meat most days. Happy dance for me. Just made this for dinner tonight. OMG!! It was really yummy…not that I was surprised. Your food sensibilities and my taste buds were made for each other. It was nice not doing the cornstarch thing with the tofu and it was still crunchy. Yay!! I cannot wait to try this! Your recipes are my absolute favorite because you make it so easy to eat healthy vegan meals that aren’t just easy, but also DELICIOUS. I haven’t tried baking tofu, so it will be a fun experiment! Thank you for the recipe! Thanks Kathie! Let us know how it goes! I was wondering, if I used bell peppers instead of the cherry bomb peppers, how much should I sub in? I have asparagus . . . will that taste as good as green beans in this? Yum! Easy and tasty, as usual! Yum, this looks gorgeous! There will never be enough ways to use almond butter, that stuff is deeeelicious! Great recipe. Super easy way to make tofu. I didn’t have a lime so I swapped a bit of vinegar and kaffir lime spice. Made this today!!!! So very good!!!! sounds great! i just wonder, why do you not marinate before baking? Highest rating! It was so good! Oh my word!! Just made this, subbed peanut butter for the almond butter, delicious, yummy!! Your site has has been a lifesaver for me since going vegan. Do you think this would hold up in the fridge after cooking to take as a lunch for a couple of days? I do! It’s best when fresh, but reheats well up to 3 days after. I completely want to try this right now! It seems like the ultimate quick fix. This is wonderful!!! I made it today for lunch with sugar snap peas–the marinade…oh my, oh my!! I’m really excited to try this method for crisping up tofu. Do you think it would work to use a silpat rather than parchment paper? I try really hard to avoid using disposables when I can, but am well aware that sometimes you just have to. Hmm I haven’t tried it with silpat! If you give it a try, report back on how it goes! I used a big well-seasoned cast iron pizza pan in the oven with nothing but the oil I tossed the tofu with, and it worked amazing! No sticking and perfect crisping. Good morning. I’m new to the Vegan lifestyle (7 days and loving it) and was wondering if you can provide your opinion/thoughts on tofu and if there are any limitations on how much/how often you should eat tofu. I’ve read various opinions on the “dangers” of tofu–soy and breast cancer. Your opinion/research would be appreciated! Check out Dr. Greger, Nutrition Facts, about his research based knowledge on soy. He now has a podcast too which is great. I love anything that uses almond butter in a savory way. Can’t wait to try this soon!